What helps make a balcony safe and stable? A safe and stable balcony is best created by engineering know how and innovation. We’ve all been on balconies where the railing seems a little loose, or the decking seems a little unsafe. Those balconies were built with the cheapest cost in mind, without consideration of occupant safety, or longevity. Today, many design and construction options exist for balconies, like aluminum balcony construction. Aluminum balconies are a rather new concept. History doesn’t have a lot of examples to demonstrate the long term value of aluminum, so it becomes necessary to have engineers who can assure property owners and occupants of a safe balcony design. 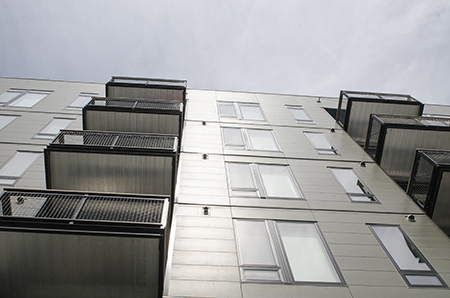 In particular, aluminum has so many benefits as a construction material, especially for balconies. Aluminum is lighter than steel, non-combustible over wood, rust free over other metals, and can meet LEED certification. Though aluminum has all of these great benefits, this metal substrate still needs engineered design considerations. For instance, the thickness of the aluminum can mean the difference between feeling the metal move or not. A bouncy metal deck or railing with bend does not feel safe. Thin metal does not feel secure. We decided that less profit margin and a substantial secure balcony feel with thicker aluminum is better. Other systems make you feel like you’re standing on plywood. In particular, right now our balcony system has a standard code of 200 lb lateral rail load, and we’re working on an upgraded system that will be even stronger. A welded aluminum balcony will also be more stable than one put together with screws. To illustrate, a balcony with screws may have a wiggle feel, and eventually screws become loose and unstable…or a balcony system with screws will always have the potential of an occupant loosening the screws. Thinking in terms of safety and stability can really start to raise a lot of questions, and choosing least cost begins to sound a little frightening. If you would like to have a preliminary balcony structure design discussion start here. Have a project or an idea? Please reach out! Sometimes we find information useful to you. Subscribe to the infrequent, every so often, newsletter.